Jonathan Nitin Brady A.K.A. 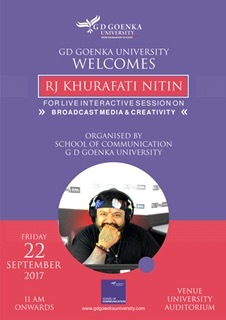 Khurafati Nitin in his upcoming live session at the University, is going to engage the young minds with his much admired experience in Broadcast Media and the importance of creativity to connect with the audience. 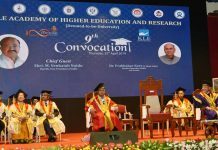 Prof. (Dr.) Ritu Sood, the Dean of Shool of Communication, G D Goenka University said” I’m delighted to welcome him, “Radio is the theatre of mind and with the use of sound design and modulation, you can paint any picture in the listener’s mind. RJ Nitin has created a landmark picture in audience’s mind of every age group over the years, his unique style has as much infectious energy as rogue charm and a delicious wit to boost.” We welcome him and look forward to hearing him live. About Khurafati Nitin: RJ Nitin has been recognised as the most popular Radio anchor in Delhi NCR FM radio circle. After starting his career with All India Radio, he has not only been a known voice on radio but has also been a host on various television shows like Brand Equity and Brady’s Day Out on Times Now, Dilli Ki Khurafat Nitin Ke Saath on NDTV and Living Cars on News X. Currently he is associated with FM channel Big 92.7 FM. His award titles include Promaxx, Indian Achiever’s Award, New York Radio Festival Award, and the list goes on. About School of Communication (SoC), G D Goenka University: School of Communication, offers specialised curriculum in the field of Journalism and Mass Communication that features a strong foundation of hallmark learning outcomes for a new generation of media enthusiasts. Core competencies of the School are scientific approaches on all aspects of communication and media science. The bouquet of flexible degree programs offered by the School, range from undergraduate to doctorate level. SoC provides a highly versatile learning environment that presents students with real-world challenges, support from a dedicated faculty and an influential network of partner agencies in the media landscape. NDTV Worldwide is the official knowledge partner with the School of Communication.